Irv Rothman may not have considered a career in the financial services early on, but he ended up in leadership positions at AT&T, Compaq and, for over a decade, Hewlett-Packard. His consistent record of success and insider perspective make him the perfect guide to the art of building and growing a financial services company, and in Out-Executing the Competition he shares his remarkable story and years of experience, giving readers a glimpse into his numerous accomplishments and providing takeaways they can apply to their own companies, whatever the industry. An engaging and lively account of Rothman's career focusing on his work at financial services companies during some of the most economically challenging periods of the past thirty years, the book explores the methods and tactics he used to help his companies not only weather financial uncertainty, but to thrive. 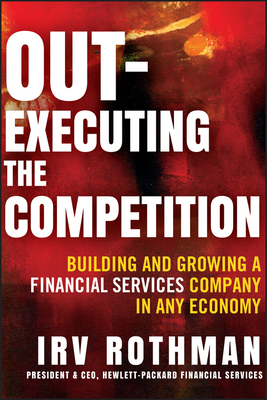 Part biography, part how-to guide, Out-Executing the Competition is the ultimate inside look at building a financial services company that's sure to succeed. Irv Rothman is President and CEO of HP Financial Services, a wholly owned subsidiary of Hewlett-Packard Company, where he is responsible for the worldwide delivery of customized leasing, financing, and financial asset management solutions that simplify customers' IT life-cycle management and reduce their total cost of ownership. Prior to joining HP, Rothman was president and CEO of Compaq Financial Services Corporation (CFS) and a group president of AT&T Capital Corporation.